I was reading recently about how wonderfully healthy farro its high in protein, B vitamins, vitamin E, magnesium, selenium and, of course, fiber. It is a whole grain wheat and one of the first grains that was cultivated, it has even been found in Egyptian tombs. It became less popular over the ages as other strains of wheat were grown, but in recent years it has become popular again and is being grown in Italy. It has a starchy quality to it that lends itself well to being made into a risotto. It can also be cooked and added to salads, used as a yogurt topping or as a breakfast cereal. then add the farro and peas stir and add a cup of vegetable stock let it simmer as it starts to dry out add more stock and keep stirring. It was a rainy day when I took this picture, but to me this was perfect, risotto is a great comfort food. So who else has tried farro and how do you use it? 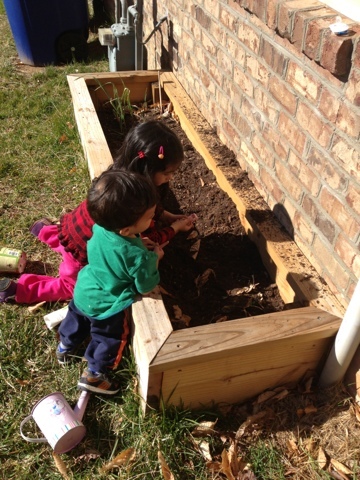 We planted lettuce and broad bean seeds yesterday if you read the post in honor of my dear Granddad it will make you smile, he was an amazing gardener and I really want to keep his memory alive by inspiring the kids to garden.